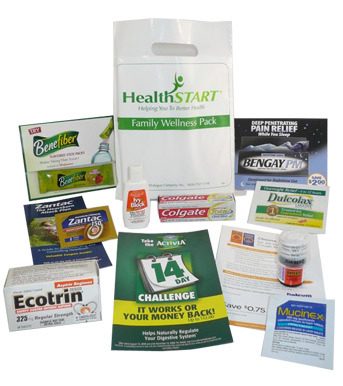 Shopper Marketing: HealthSTART is a customized shopper marketing program that targets health concious consumers at leading retailers nationwide. HealthSTART delivers proven results in building brand awareness, trial and retail sales. Contact is through pharmacies and retail-based clinics located in food, drug and mass classes of trade. Audience: Consumers visiting pharmacies and retail-based health clinics for a sick visit, flu shot, health screening, immunization, physical exam or medication pick-up. Quantity: 100,000 - 300,000 health consumers (exact quantity based on your needs). Gift Bag Components: Sample delivery, brand literature, coupon delivery, high visibilty branding on sample vehicle, store staff communications, POP material delivery, category/drug class exclusivity and ROI market research. Components are available as a package or individually. Highly targeted digital advertising to the exact consumer segment you want to reach, based on specific health topics being searched, web sites visited, demographics and geographic location. Quantity: Selectable based on the number of brand impressions you want to generate & traffic you want to send to your website or landing page. Components: Search & display ads for branding, purchase incentives and/or sample offers. Food: Kroger, Safeway, Publix, etc.